When someone is injured, or worse, when someone wants to give the appearance of an injury, the thought, details, and circumstances are usually not a well thought-out idea. Especially if the injury was an actual injury and caused by a legitimate accident. Nothing is well-thought out in a spontaneous event, it’s the very definition of an accident, isn’t’ it? Therefore, the circumstances of the event should come naturally and at times, thoughts may be vague or difficult to remember. In an insurance claim, a recorded statement becomes a tool for the handling adjuster to gauge a plethora of circumstances. An insurance adjuster has the unique responsibility, often from an off-site location, of ascertaining the details of an accident. Once the facts are brought to the surface, beginning the process of fairly mitigating the claim for the insured becomes paramount. Always keeping in mind, the process must be handled in good-faith, with the health and well-being of the claimant in mind. What better way to start the inquiry process than a recorded statement? There really isn’t a better way. It’s the best way to get the facts on the record when the details are fresh in the mind of the claimant and the witnesses that may have observed the event. In today’s day and age, it’s also important to catalog social media outlets if spontaneous utterances are mentioned by witnesses, involved parties, or second hand sources. These are sometimes available in the comment section of a media outlet in high profile losses. To start my research on this topic, I Googled “Recorded Statement”, isn’t that what we all do now. The first thing that popped up was a blog posting from a self-proclaimed “personal injury attorney” and it said, “Q: Should I give a recorded statement to the insurance adjuster? A: Here’s the short answer: NO!” Just to be clear, I didn’t capitalize the no, or use an exclamation point, that was already in the blog posting that way. No matter what the conflict, if my adversary was suggesting (and they are more than just suggesting), the claimant not provide the details of the event and other claim relevant information in a recorded and review-able form, it’s the first thing I would want to gather as the adjuster on the file. 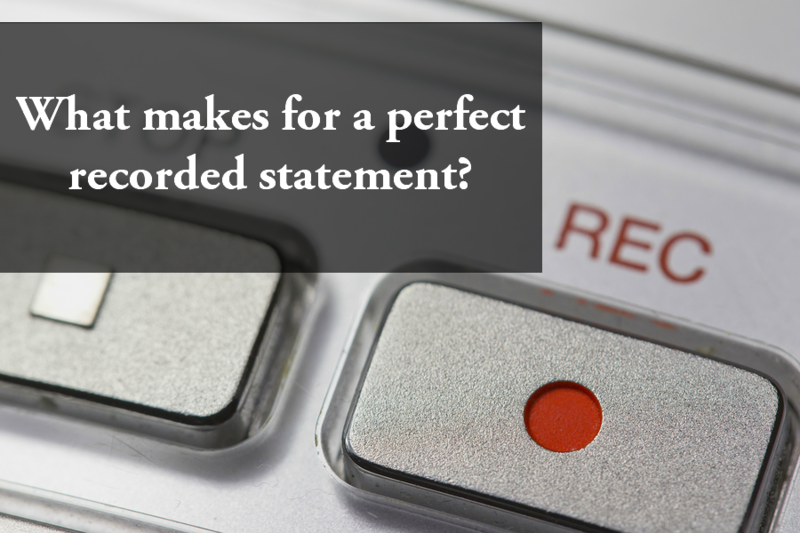 A recorded statement provides a tool for the adjuster to establish a baseline of the event. What happened? Who was involved? Who was at fault? A recorded statement will get the adjuster closer to understanding the specific details of the accident. Possibly stumbling across subrogation or apportionment opportunities with other at-fault third-parties. A recorded statement will prevent add-on injuries and/or add-on circumstances that often plaque malingering claims at the tail end of a fair settlement. A recorded statement keep generally keeps the facts at the forefront and eliminated rumor and conjecture that creates a smoke and mirror effect for the claimant or their defense counsel. A recorded statement medical professionals with accurate details or an accident and allows for a proper assessment of injuries, or, in the event the facts are manufactured, provides the same medical professionals with a reference point to establish a well thought out rebuttal. Is your investigative professional or claims handler properly prepared? Every claim is different with its own set of circumstances and questions? Are there similar, even the same claims? Sure there are. But even the claims that appear similar in circumstance, present different questions when it comes to the validity and value of the claim. Will the statement stand the test of admissibility? Remember, a statement taken in 2015 may need to be ready for a hearing in 2019 when the claim winds itself down. The statement itself should have some basic qualifiers, such as, permission from the subject to record the statement, a date and a start and end time to the statement, the proper identification when the statement is in person or the proper qualifiers for telephonic statements, and allowing the subject to speak at the end of the statement with an open ended question that allows them the opportunity to detail circumstances or facts that the interviewer may not have covered during the interview. Is the interviewer fair and impartial during the conversation? When talking with a claimant or witness, it’s important to display a sense of impartiality and to build a report with them so they feel comfortable telling you everything. An interrogation brings out the “suspect” in anyone. If you are being questioned and the proverbial light is blaring in your eyes, you automatically become defensive and the truth becomes a mere possibility, with your best interest taking a front row seat. No matter the liability, you always want the truth from the inception of the claim. Statement guides are great. Statement guides are terrible. A statement guide is necessary for a statement. A statement guide keeps the statement focused and streamlined. It takes a conversation and gives it a start and an end. However, with that said, the statement guide can be like a pacifier to a baby. Becoming too reliant on a statement guide can have a negative effect on an investigator and fail to provide the necessary details needed to properly mitigate a claim. Peeling back the onion is a task that must be mastered. Like any good lab researcher, trial and error is usually the key to finding the right process and the right elements for the perfect outcome. Similarly, any good interviewer may not get the necessary answers to initial questions about the event. The follow-up questions, the questions not mentioned in the statement guide, then become the most valuable part of the interview and allow for a much more detailed understanding of the events that took place. For every question on a statement guide, the interviewer should ask an additional two questions to drill down to the most granular details. Therefore, a statement guide with 100 questions should, in most cases, have at least 300 questions answered when all is said and done. The pointers could go on-and-on, but above are the main issues that present themselves during a recorded statement and should be addressed at some point prior to the day of the statement. Like anything else in the investigative community the five Ps are crucial, proper planning prevents poor performance. Speak with the adjuster and gather the immediate facts and establish the red-flags and questions surrounding the event. Develop the statement guide that best addresses the questions that need to be answered that will assist the adjuster in mitigating the claim. Get the guide approved with the adjuster prior to the statement and add any last minute questions not thought of during the initial preparation. Discuss the statement with the adjuster when the statement is fresh. In doing so, the adjuster can appropriately change directions, if needed, immediately after the statement. GET THE STATEMENT TRANSCRIBED. Too many times, I’ve seen investigators versions of statements not match up with the actual statement. This allows the plaintiff’s counsel the opportunity to question the validity of the entire statement based on a prejudicial environment. TIG Risk Services employs experienced and capable SIU Coordinators who follow the claim from the “cradle to the grave” to ensure quality and continuity. If you have a claim and you want to discuss, call us anytime at 850.424.6390. Or, shoot me an email at briand@tig.us. TIG offers local, regional and nationwide coverage for all of your investigative needs.